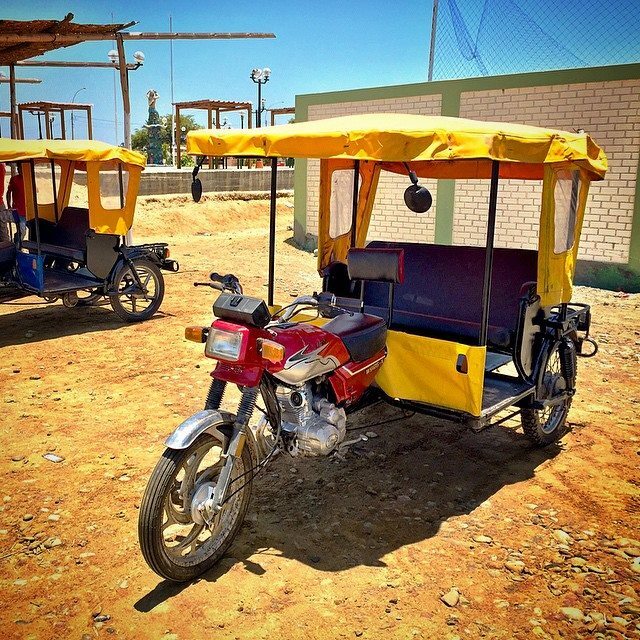 I will be driving this hunk-of-junk 3500km across the entirety of Peru. I just finished my first test drive, and it is as terrible as expected. The drive chain connects to the rear left wheel, so it constantly wants to turn right. Left hand turns, on the other hand, are a gargantuan feat of strength, fighting against the raw winding power of this 125cc engine. The starter is broken (it requires a kick start, every time, which means 10-20 attempts and a lot of swearing). Shifting gears on this thing is like patting your head and rubbing your tummy at the same time, while riding a unicycle. This entry was posted in Mototaxi Junket and tagged hunk of junk, mototaxi. Bookmark the permalink.